Janice Riggs of The Vivienne Files recently posted a terrific quote from Betty Halbreich, the famed personal shopper who for decades dressed Bergdorf Goodman's swank customers. 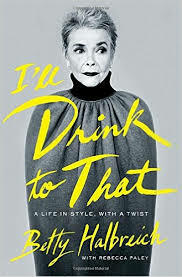 In her tart autobiography, "I'll Drink to That" (Halbreich favours the Mad Men era, libationally), she says that she refused to let a woman leave Bergdorf's in something that did not suit her. She even told compulsive shoppers that they already had enough. How counter-cultural Halbreich's approach is today! Personal shoppers still exist in large cities, but they're endangered as the watercress sandwich. Where I live, Holt Renfrew have one (with a dedicated fitting room); Ogilvy (now owned by Holt's) too, if you ask, but most shops supply a sales person whose sole contribution is to ask, "What do you think?" Pressure sales tactics are a major reason why I do much of my shopping online, and why retail stores are in deep trouble in the US. 1. "I just bought the same one"; or if the salesperson is twenty-five years younger than you, "My manager just bought that and she looks fantastic." Maybe—but I hear this line too often for it to hold water. 2. "They're flying out of the store." Why would that make it right for you? Designed to push the persuasive button of scarcity, same as "This is the last one in your size." 3. "You just need...". This is uttered if you express an objection. You just need to shorten it, wear it with a strapless bra, or sew the pockets shut. I'll agree to the lingerie, but not major alterations. Other persuasive tactics include "This is the best season from (designer) yet", and "You look better in this than anyone who's tried it on": perhaps true, but irrelevant to your decision. Recently, a commenter said, "I don't think every item of clothing has to be "flattering" whatever that means..."
In the wider sense, "flattering" means the cut, fit, and colour highlight your best physical features. For example, if you inherited sloped shoulders, an unstructured jacket will make you look like an egg; a jacket with a discreet shoulder pad will give you a better line. Stylish clothes may not be flattering, and vice versa. Though 'flattering' is definitely about vanity, it is also about wise consumption. Not understanding what suits you leads to the "stuffed closet but nothing to wear" situation. I agree with the notion that not every item has to be flattering, to a point. 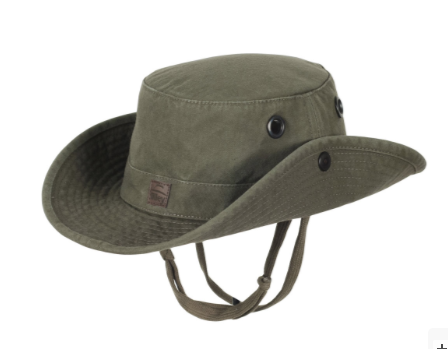 If you're going camping, you might wear a Tilley "Wanderer" hat, the essence of unalloyed functionality. And sometimes, what flatters you might not appeal for other reasons: red makes your skin glow, but you can't stand it; short skirts show off your legs, but you're a pants woman. But usually, I'd like a garment to ennoble, rather than just provide upholstery. She may also have been thinking of certain professional roles, which take you to a classic, neutral suit, even though a vibrant print dress makes you look more energetic, or at least more fun. Some of the specialty stores still offer a personal shopper, and not strictly for big spenders (but I concede that an appointment probably means a purchase.) A personal shopper, like an image consultant, might introduce us to clothes or accessories that make us feel wonderful, things we might have passed by, driven by habit. Should that happen, it's a learning experience, not just shopping. Bergdorf's is a temple of luxury. The less-costly levels seem to offer only two speeds: hard-sell and no-sell. At COS, once you're greeted, they barely notice if you are alive. So, I raise a virtual martini to Betty Halbreich and her kind, visual artists first, sales associates a close second. If specialty apparel wants to survive, bring us more Bettys and pay them decently for their skill. I was a personal shopper THIRTY YEARS AGO, at Younkers in Des Moines. We had a color analysis specialists there, too... We helped women put together work wardrobes that were functional and flattering, and we worked like demons to get our customers the best stuff in the store (for them!). We earned slightly more than the sales people on the floor, but at that time we all worked 40 hour weeks and that job was our only, full-time, professional gig; I supported myself quite well on what I earned. Maybe if stores had full-time staff who stayed in their positions for more than a few months or years, the whole shopping experience might be better. But then the stores couldn't all boast having the lowest prices, which seems to be the only variable that matters, anymore. I loved that book - and her knowledge of clothes, and her customers was fascinating and enlightening, especially given what most of us endure these days. Shopping is rarely pleasurable - most of the time I'm either ignored or the salesperson is stuck to my shoulder and every item I look at is "so you and perfect" = Do they really think we can't tell a lie when we hear it? A good salesperson, who knows her customers, and actually listens to them is worth her weight in gold - and I will return again and again to a store that has just such a gem. Unfortunately they are few and far between. I think this is one of the reasons that I've come to adopt a uniform look - I've found the items that work for me and my lifestyle and I feel confident in repeating this look and it then allows me to shop online more confidently. The modern bricks & mortar shop is contributing to their own demise by such short-sightedness. The few shops that do offer this "service" are too high end for me - and given that I'm around a size 16 most don't carry my size anyway - and it's amazing how quickly a woman of my size can become invisible when she walks into many women's shops these days. And yet, I believe the latest statics say that nearly 2/3 of NA women are a size 14 or larger - but trying seeing that reflected in today's shopping mall. Yorkdale Mall here in Toronto has expanded to over 200 stores but I could find something to wear in perhaps 4 of them. It seems to me that they have little to complain about if women turn to online shopping, Perhaps the online vendors should find a way to offer more personal shopper help - that would boost their sales even more. With today's technology it shouldn't be too difficult! I even like to think of Janice (Vivienne Files) as one of those online "Personal Shoppers" for us - she does the research and presents so many options and scenarios for us as far as vendors, styles and colours are concerned that it helps us to narrow things down or to look at things we may have never considered - or even knew were out there. Her knowledge is vast and she offers us a service that we can no longer find out there "in the real world". MargiefromTO: Where those of us who are 'uniform dressers' get caught is when we need something outside our usual- and could really use someone's help. Even upscale malls like Yorkdale are exhausting for me. Some online vendors (J. Crew, Lands' End, Boden) offer "personal shoppers" by phone or chat. That has been useful to me when I am wondering which size to order or more info about a garment, but it is far from true personal shopping. Image consultants (Toronto has many) will go shopping with you. I would do this if undertaking a major wardrobe refreshl. I had a day with a TO image consultant once, as a barter for some work I did, and it was fantastic; we did a closet clean out and I learned things from her I still use. I just made sure I had one my age. I've heard a few people mention Image Consultants and yes, if I was doing a major overhaul to my wardrobe it would be money well spent. And yes, you make a very valid point about any items out of our comfort zone dressing. Special occasion dressing is difficult and perhaps an experienced but retired saleswoman could offer her services at a reasonable price to assist with this sort of shopping - I know I'd find it helpful. Yorkdale has become overwhelming - he last time I was there I actually had a bit of a panic attack and had to leave - immediately - I just found it all so over the top and it made me feel ill. I'd never reacted that way before. I loved Betty's book too...a personal shopper service would be a luxury as a retiree but as a working woman I think it could be a time saver and well worth the money. One needs to be confident when going shopping to try on clothing...if one listens to the people who are hired to sell, one has to be prepared to hear those lines used to move merchandise. In small boutiques locally we have trusted women who are honest and will say..."you could do better" or "let me find you something I think will suit you" or "we have some things coming in next week and I know there are a few pieces that are going to be fabulous with what you already own...I will call you when they come in." hostess: Oh, you are lucky to have that level of attention. When I write "personal shopper" I am referring to staff of a store, like Halbreich was at Bergdorf's. The customer pays nothing. It's a different deal when you hire an image consultant (or stylist) to go shopping with you, or to go shopping herself and bring you the selection. I know several very busy executives who do this. I know another woman- a school principal- who rents all her business clothes! Margie: I would rather go to one boutique, even if there is nothing there, and then try another one awhile later, than face the ant farm that is the mall. I find this so tough, because if the SA does give the attention I'd like, I too quickly get a sense of being socially obligated somehow.. . it's easy to get swept up in someone's enthusiasm, although I'm at least very clear about my general parameters and I have some very clear Dos and Don'ts. No point telling me I don't have a short waist, for example, so that I can wear whatever waist-defining dress you think would be "awesome" on me. . . I think what's really frustrating for me is that when I do find an SA who pays attention and who brings something to the process besides false flattery, I often add something to my wardrobe that turns out to be a real gem, something I'd have walked past on my own. Something my daughter suggested last time we were in Nordstrom together and I found the leather skirt I'd been looking for forever was to ask an SA to pull any other contenders in the category -- we went for lunch and when we came back she had six others for me to try. I liked none of them anywhere near as much as the one I'd chosen, and I also saw that -- especially on sale -- the price that I was paying was a decent one for what I was getting. As for Gauss's comment re what’s flattering a few posts back, I’m with her if she’s questioning the (at least implied) assumption that we all want to look taller and slimmer — the adjective seldom means more athletic or rounder or more intelligent. .
Haven’t been finding time to comment but enjoying your posts — I like this idea of blogging/writing as a craft that doesn’t consume, materially . . . There was such a boutique near where I live in Washington DC. The saleswoman brought me a pair of pants that I would not have considered -- these were cotton ankle-length pants, and this was five or six years ago -- that looked absolutely great and that I eventually wore out. She paired it with a blouse I would also not have considered, since it had a gathered bottom band. But together they looked great and disguised extra belly plumpness I was very self-conscious about. And all this without actually remarking on my figure flaws. Sadly, the store closed a few years ago. Not a direct sales tactic, but more of a buttering-up tactic: complimenting you on what you've worn into the store. I concluded it wasn't a coincidence when every salesperson I came across started doing it. materfamilias: I am by now inured to the assurances that I can wear whatever and fake "aren't we having. fun?" friendliness, though I do appreciate thoughtful service like you had at Nordstrom's with your skirt. And you went back- your latest MOTB dress is a stunner! So once again their approach of superior service pays off. Sisty: Now that's a gem of a sales person! I have seen retail sales training manuals that teach the "compliment the customer" tactic. As you observed, it is a 'softening' device. Duchesse - - "Because the Night" is listed as your latest post but all I get is a 404 Error Message for this one - I can access all prior posts. Just thought you might like to know that here seems to be a bit of a glitch somewhere. Margie: iThat post will run Tuesday; my mistake. Thank you.